More than 400 Scripps doctors now have star ratings posted publicly for patient experience surveys. Photo by Megan Wood, inewsource. 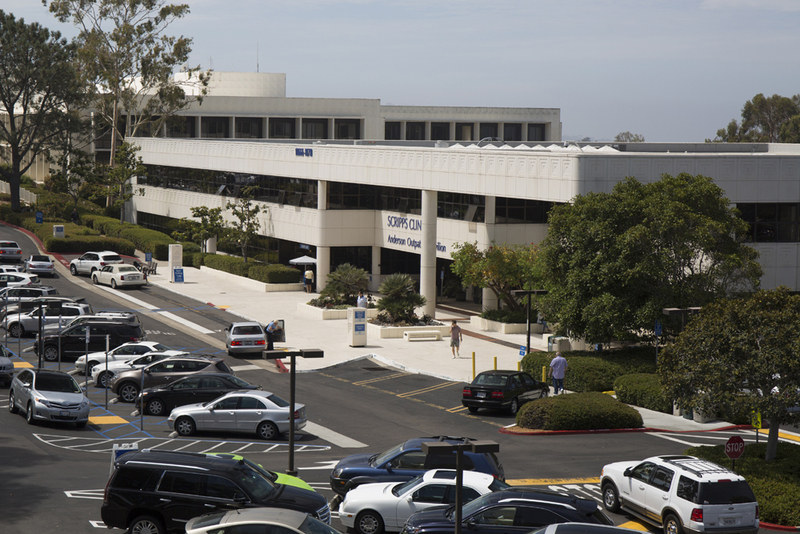 When Scripps Health started using patients’ reviews to give online ratings to hundreds of its doctors last August, the San Diego health system became the second in California to do so and one of a dozen nationally. Today, about 50 systems score their doctors with one to five stars, with 16 launches since Jan. 1. The transparency trend is taking off. It appears to be a bold move, one that could expose mediocre providers in a way that could hurt their bottom line and send savvy patients looking elsewhere for a doctor who is not so rude. But for nearly all star-rated doctors nationally, variation is barely distinguishable, raising questions about whether the expensive and time-consuming effort provides information that improves care, or is just a slick marketing ploy that makes all doctors look pretty darn good. After office visits, a contracted survey company asks patients whether the doctor’s friendliness and courtesy were very good, good, fair, poor or very poor, and if they would recommend the provider. Patients indicate how confident they were in their doctors, if their doctors were understandable and if doctors spent enough time listening. Some systems even ask patients if they were kept waiting more than 15 minutes. Responses dealing with patient experience — health systems choose which ones to include — are converted to a star rating for each doctor. Some organizations use their own conversion tools, while others use algorithms provided by the survey vendors. A look at the profiles of 406 physicians in the two San Diego County medical groups participating, Scripps Coastal and Scripps Clinic, revealed 92.1 percent received 4.7 to five stars, and those scoring lower don’t look all that bad. Pediatrician Dr. David Herz got the lowest score, 4.1 stars, while dermatologist Dr. Catherine Chen got 4.2, gastroenterologist Dr. Warren Reidel got 4.4 and pediatrician Dr. Barry Goldberg got 4.5. An additional 22 doctors got 4.6. These surveys don’t measure a doctor’s diagnostic skill or whether he or she prescribed effective treatment, which may matter more to some patients. Additionally, the posted ratings usually exclude how patients experienced other elements of their visits, including staff courtesy or parking, or annoying phone time spent on hold. For most of these surveys, only the patient’s direct interaction with the doctor is what gets publicly scored, based on the argument that other elements aren’t under the doctor’s control. Scripps Coastal President Dr. Kevin Hirsch echoed the sentiment of officials with other health systems that have taken this step. He said the groups decided on the star rating largely because they want their doctors to show up on Google search pages above listings from third party review groups such as Healthgrades or Vitals. These companies base their star scores on far fewer reviews — some of which may be from the physician’s competitors or family members rather than real patients — and the reviewers tend to score doctors much more negatively. Through their own survey vendors, health systems can get feedback from thousands of actual patients in a year, and thus get more reviews. Even with Herz’s relatively poor score, he shows up with 43 reviews at the top of the Google search page, better than Healthgrades’ 3.4 stars with 10 reviews, Yelp’s three-star rating with two reviews and Vitals’ 3.5 stars from 17 reviews, Hirsch said. The trend of health systems taking ratings into their own hands began with the University of Utah Health Care in 2012. Like most other systems since, Utah has taken this initiative much further than Scripps by posting patients’ anonymous written comments — from laudatory to scathing — which some say gives far more meaningful information about what a visit with that doctor is like. Utah also includes aspects of the office visit beyond just those with the doctor in the exam room. Dr. Vivian Lee, the Utah system’s CEO, extols the benefits of the project, and at a recent conference on health care data in Washington, D.C., explained how doctors have improved, some through “SWAT teams” that work not just with doctors but with nurses and receptionists. “We had physician communication training and we even expanded our free valet parking for all our patients,” Lee said. Last year, “there were probably a half dozen health care systems implementing this type of star rating program, but today there are more than 50,” said Andy Ibbotson, vice president and general manager of the National Research Corp., the second largest health care survey vendor in the nation. Nearly all of them, he said, publish patients’ comments. Utah and many other systems also display physician star ratings for each question, while Scripps aggregates all responses into a single star rating. That can veil weaknesses that patients may want to know, including how well the doctor listens. Dr. Greg Burke, chief patient experience officer for Pennsylvania-based Geisinger Health System, which went live with star ratings and comments for 1,300 clinicians in October, acknowledged the program is “like Lake Wobegon, where everybody is above average,” except for the patients’ comments that are posted underneath. Now, most physicians have improved their scores dramatically, he said. “Obviously, the reason these hospitals are doing this is because of marketing. That goes without saying,” said Dr. Ashish Jha, who has studied and written favorably about this trend. But star ratings alone, which show little variation, are not enough, said Jha, director of the Harvard Global Health Institute. An important element, however, is that these are real patients expressing their opinions, not competitors or someone’s mother. Doctors’ fears and concerns have mellowed because of all the advance work Northwell did before launching its star ratings, he said. “We started providing feedback well in advance of the public posting because we wanted doctors to see what their scores were going to look like so they’d have opportunity to make changes,” Nash said. “I will tell you the truth, you can’t change the stripes on some tigers. And for some, scores go up and down in a continuous process,” Hirsch said. Some have agreed to let higher scoring doctors shadow them to suggest ways to improve. Of course for some physicians, showing up with a higher number of stars seems trivial. Dr. Denise Brownlee of Scripps Coastal, who received 4.7 stars, said tersely, “I’m not interested. I’m retiring in two months.” Several dozen other doctors did not respond to calls for their opinion on the rating system and some receptionists said they were not aware their physicians were being scored. Dozens of other star-rated doctors, including those who received the lowest scores, refused to respond to a request for comment. Care about it or not, national experts say such public scores are not going away.